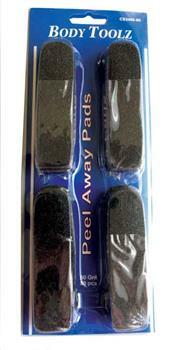 Peel Away Replacement Pads come in 80 Grit or 120 Grit sizes. 80 Grit is the roughest grit for hard rough callus. 120 Grit for smoothing rough calluses. Each package contains 80 replacement pads one size only.